89 organisations from 34 countries have called on the UN’s International Civil Aviation Agency (ICAO) to ditch plans for aviation biofuels and carbon offsets, as the Agency’s governing body convenes in Montreal to finalise proposals for a controversial “Carbon Offsetting and Reduction Scheme”(1). 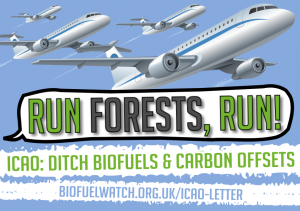 An Open Letter by the groups (2) warn that ICAO’s proposal could incentivise airlines to use large quantities of biofuels made from palm oil in their tanks in order to meet greenhouse gas targets – even though member states rejected biofuel targets last autumn amidst concerns about palm oil. Proposed biofuel targets for aircraft were rejected by member states in October 2017 (3), but groups fear that the proposed new rules will introduce large-scale biofuel use ‘by the backdoor’. Nele Mariën from Friends of the Earth International highlights the groups’ concerns about the second part of the UN proposal – carbon offsetting for airlines: “There is no way of reaching the goal to limit global warming to 1.50C unless all states and sectors rapidly phase out their carbon emissions. This means that there can be no role for offsets”. The Open Letter urges member states to reject the biofuel and offsetting plans and to end and reverse the growth in aviation.